When you’re scouting locations for your event, easy access to power isn’t necessarily high on your list of “must-haves.” Whether your ideal venue is a warehouse, a large ballroom, or a hotel, one thing everyone is focused on is trying to create an event that attendees are able to enjoy. 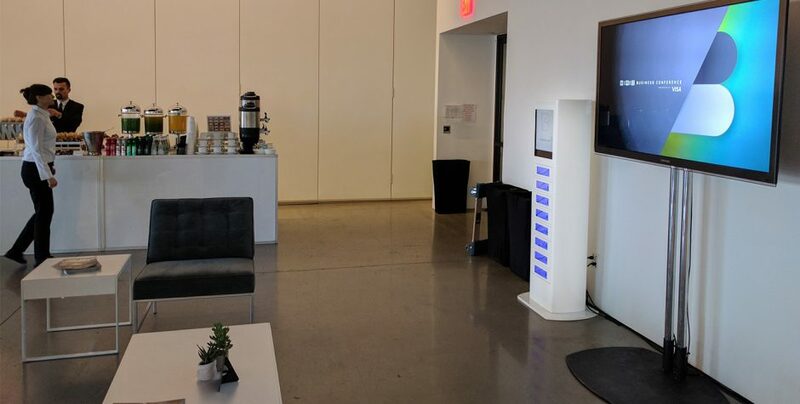 Phone charging stations at events allow people to roam around freely and not have to worry about charging their phone, thus helping to contribute to attendee satisfaction. Here are 5 things you won’t have to worry about when choosing to use a phone charging station. An attendees closest power source might be 50 feet away from where they’d like to be at your event. Save yourself the hassle of buying extension cables last minute by choosing our battery-powered option instead. Running power cables can be a challenge if you don’t have much space to work with. We also understand that taped-down cables might not fit your aesthetic. Using a charging station alleviates the issue of having to run power cables in walkways or in areas where event attendees may trip over them. If you’ve ever attended an event where your battery died, you know all too well that finding an open outlet can be a challenge. Between vendors using outlets to power their displays, event staff shooing you away from outlets, and other attendees fighting to charge their devices, a spare outlet can be a rare commodity. Spare yourself the hassle by switching to phone charging units. Have you ever done your laundry in a laundromat, only to come back and find your wet clothes on top of the washing machine and someone else’s dirty laundry in the wash? The same thing happens with power cables every day. We know all too well that the right location can directly influence your success. If you’ve ever felt tethered to the closest outlet, using a charging unit will give you the freedom you need to roam!